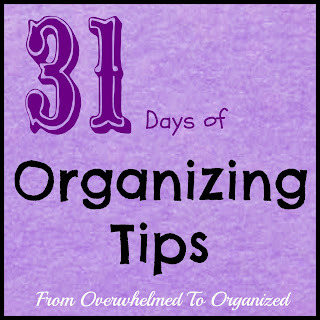 Welcome to Day Fifteen of the 31 Days of Organizing Tips series! I'm so glad you've joined me. Throughout this series I'll be sharing organizing ideas that I've found around the web that I love and that will help you on your journey from overwhelmed to organized. You'll find a complete list of all the posts in the 31 Days of Organizing Tips tab above, or at the end of this post. 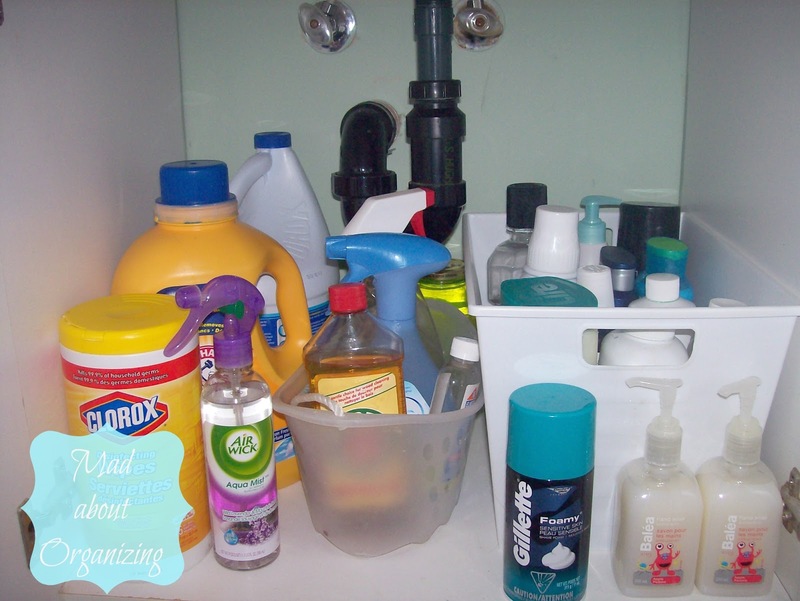 Today's tip is to help you organize your bathrooms. Regardless of how many bathrooms you have and how large or small they are, organization is always important. 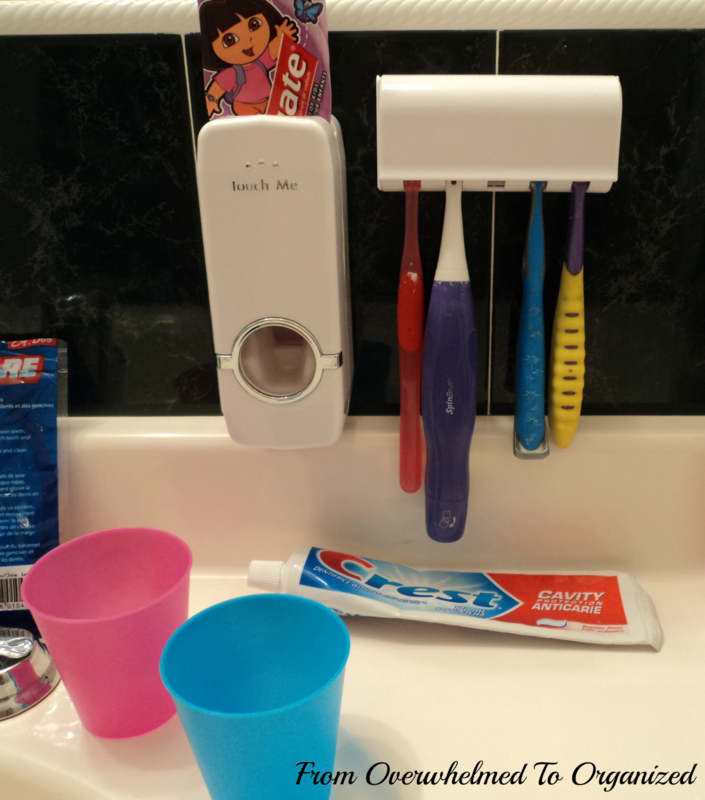 We use a lot of personal items in our bathrooms so we need creative storage solutions to keep those items out of sight or stored neatly, while also keeping everything accessible. If you feel overwhelmed in your bathroom because it is cluttered or disorganized, it can impact how you start your day. How many times have you been in a rush to get ready in the morning and can't find what you're looking for? 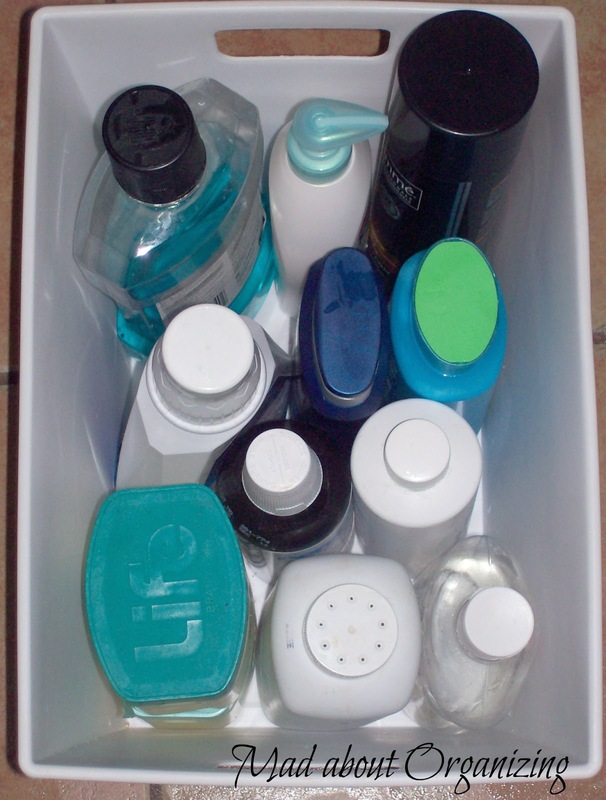 It causes unnecessary stress and chaos if your bathroom isn't organized. Plus, who wants to spend any extra time in the bathroom?! But, it doesn't have to be that way! Small changes can make a huge difference in a bathroom. 1. 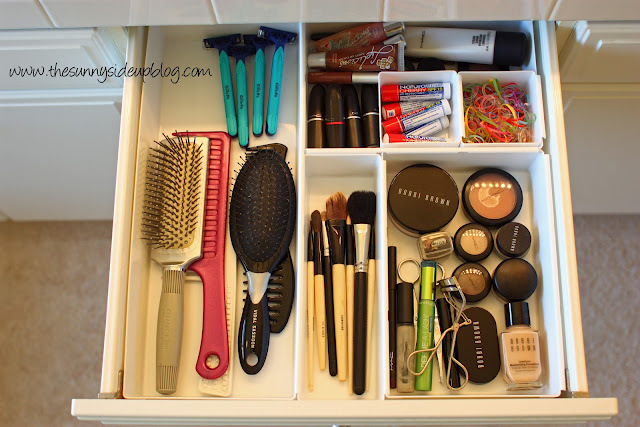 Organize your bathroom drawers. Use drawer organizers to group like items together so you can quickly find what you need. This works for your master bathroom and kids' bathroom. 2. 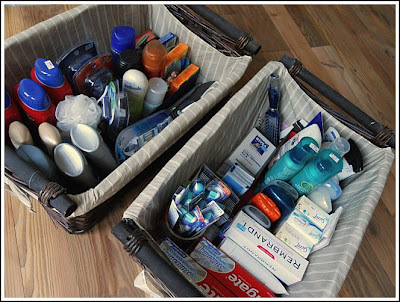 Use baskets or trays to group like items together such as towels, wash cloths, supplies, and toiletry items. 3. 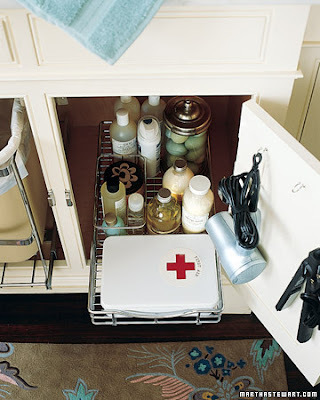 Maximize the space under your sink. Use plastic drawers or stacking bins under the sink to group small bathroom items (especially if you don't have drawers and need to use your space under the sink for these kinds of things). Store tall bottles of personal hygiene items in deep bins or caddies so they don't fall over when you reach for one. Or you can use sliding trays like those pictured below to access the things at the back of the cupboard. 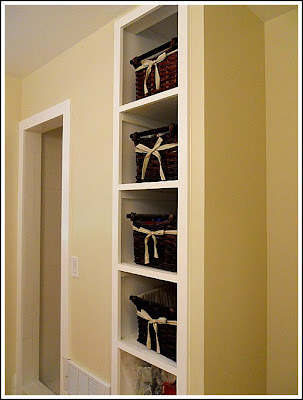 And you can hang cup hooks on the back of the cupboard doors to hang small appliances or towels. 4. Keep your counters as clear as possible. This will help keep your bathroom from getting cluttered and feeling overwhelming. 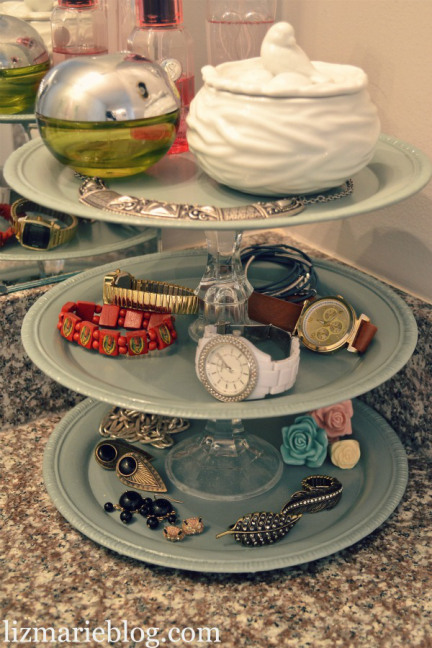 Tiered organizers can give you more vertical space while looking pretty. Here's one you can make yourself. To keep toothbrushes and toothpastes off my bathroom counters, I installed a toothbrush holder and toothpaste dispenser on our walls. Please remember to pin from the original source for all these fantastic pictures! There are so many great bathroom organizing tips online that I'm going to do several posts on bathrooms. 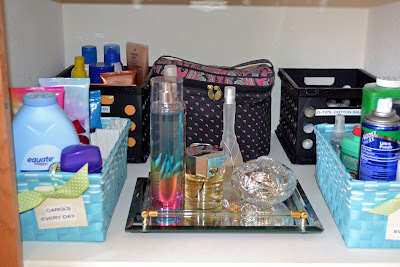 Today I gave tips for organizing your bathroom drawers, cupboards, and counters. Tomorrow I'll talk about using wall space to help organize your bathrooms. How do you organize your bathroom? What's the best organizing tip you've implemented? These are some wonderful tips, Hilda! 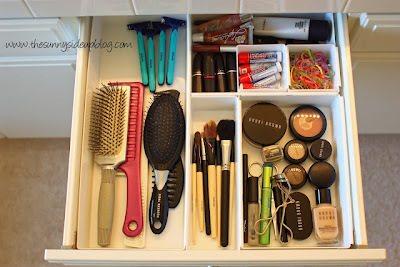 I love the drawer with the dividers (I wish I had drawers in my bathroom) and especially agree with keeping your surfaces clutter free. LOVE the tiered organizer! You're welcome Kristina! I didn't have drawers for a long time either so I had to get creative with the cupboard under the sink (before the days of Pinterest for ideas too LOL). Thanks for your encouragement! Great ideas! This is motivating me to organize my bathrooms. :) I'm visiting from the blog hop over at Mom's Best Nest. I've been overwhelmed for a while now. It is simply hard to find time to organize! These are great tips. When I get the time to organize I will definitely be using these. Stopping by from Mom's Best. Hope to see you at True Aim! Thanks for stopping by Tulip! I'm following you on G+ and love your blog. Organizing doesn't have to take a lot of time. I organize a drawer in my bathroom while my kids are having a bath or organize a kitchen drawer while a pot is boiling. I waste lots of time looking for things when I'm not organized, so I figure I might as well make time to set up a system that will save time in the long run :) Good luck getting organized! I recently turned the girls drawer full of hair bow/tie madness into an organized spot with small baskets I found for $1 at Staples. Now the pony tail holders have a spot, the headbands, the clips. It's lovely. I also recently put a 3 drawer plastic bin in our main floor bathroom to help contain the hairbruses, hairdryers, combs and things that we use regularly down here. It's all really really helped to clean up the clutter and make things easier to find and use. Great tips! Thanks for linking this up to The Fun In Functional! Thanks Jessi and you're welcome! There are plenty of accessory sets available on the market which includes soap dispensers, toilet tissue holders, toothbrush holders, towel racks and a great deal more to make your washroom look fantastic.